Ever since we introduced our neighbors to our classic Flammkuchen two years ago, we are not allowed to participate in our annual backyard party without it anymore. Which isn’t really a big deal, since I could have it once a week, easily – it’s so simple to prepare and tastes so damn good. But sometimes I break my own rules. One of the most important ones would be “don’t mess with classics“. It wasn’t really all my fault… but during preparation of a dinner for friends my onions (from the classic recipe) acted up and I quickly needed a plan B. Shopping wasn’t an option, so I had to raid my pantry… and settled with peaches and goat cheese. Who knew this would turn out just as good, if not better – at least during hot summer times!? Anyways, I already convinced some readers of my column over at the German Küchengötter and since I’m currently fully preoccupied with recipe testing for my next book, why not in the meantime share my old new favorite with you, too? Start with the dough: Add both flours and salt to a large bowl, mix briefly and make a well in the center. Dissolve the fresh yeast in lukewarm water, pour into the well and add the olive oil. Knead well, either by hand or with a machine. I only use my Kitchen Aid for this job and it takes roughly 3 to 5 minutes (medium speed). The dough should come together nicely and clean the sides of the bowl all by itself. If it is too sticky, you can add more bread flour by the tablespoon. Shape into a ball, cover with a kitchen towel and let rest for about 45 minutes at a warm and sheltered place. After the dough has risen, punch it down, divide it into 2 equally sized portions, shape them into neat balls and let them rise again under a kitchen towel for 20 to 30 minutes. Preheat the oven to 250°C (~480°F) or as hot as your oven permits and place a baking tray on the bottom level, so it gets preheated, too. Prepare the topping by mixing the Crème fraîche and heavy cream with spices (salt, pepper and nutmeg) to taste and cutting the washed peaches into thin slices. Line an extra baking tray with parchment paper. Flatten one dough ball with your hands and either roll it out thinly (similar to pizza dough) with a rolling pin or by stretching and pulling the dough with the back of your hands (be careful, since this dough contains rye flour, it is not as easy to handle as regular pizza dough!). Apply a nice deal of the Crème fraîche mix on top and decorate with some Pancetta (optional) and the peach slices on top. Finish by crumbling the goat cheese on top. Transfer to or slide onto the preheated tray and bake for about 12 to 15 minutes or until it has gained a nice golden-brown color. I usually discard the parchment paper after 5 minutes of baking (just pull it out very fast), to ensure the bottom develops a nice crust. Take out and sprinkle with fresh basil leaves and enjoy hot or lukewarm. Required time: ~2 hours (incl. rising), baking 12-15 min. I love playing with the classics. Sometimes you get tired of the same thing and desperately need to change it up, no harm in that. Your flammkuchen looks fantastic! Congrats on the third book! Meine Familie liebt Flammkuchen, meist muss ich mehrere Bleche vorbereiten, sonst gibt es Ärger. Wobei dieser süsse Fruchtbelag für mich ganz was neues ist, muss ich ausprobieren. I think a "flammkuchen"-shop would make you rich! :). How long do we have to wait for your next book and what is it about? I think there can never be enough versions of flammkuchen and I haven't tried a summer version! 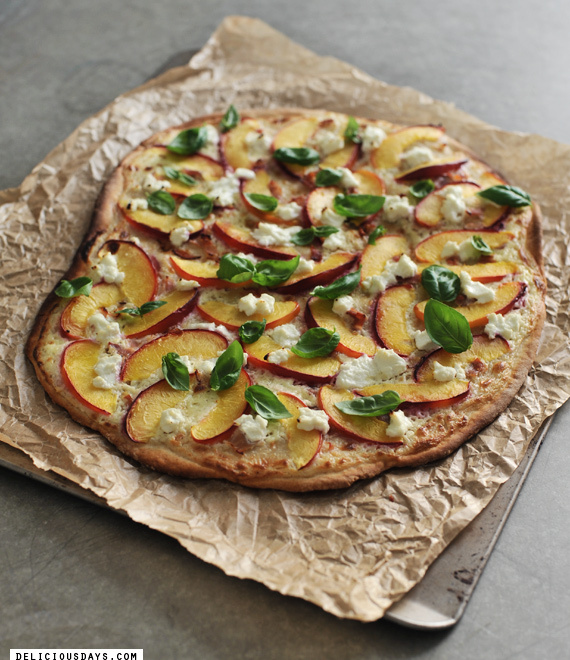 Peaches and goats cheese sound scrumptious, have to try it asap! I saw your post this morning and had to make this flammkuchen version immediately. I just finished my last slice. It was so delicious! Thank you so much for this late summer treat, Nicky. WOW!! Das muss ich testen. Wie passend morgen gibt's auch noch Besuch. yummy, yummy!!! Deinen Flammkuchen gibt es bei mir inzwischen auch fast im Wochentakt, so gut ist er (und so häufig wird er von diversen Mitessern verlangt...). Dabei hab ich mich auch schon dran vergriffen und Hawaiiflammkuchen mit Vollkornanteil draus gemacht. Diese Variante kann ich mir mindestens genauso gut vorstellen, wird beim nächsten Mal gleich nachgemacht! Oh so exciting! I was just wishing I could sink into a terrific bite of flammkuchen, can't wait to try this. I'm going to make this for tea tonight. Hopefully mine will be as delicious as yours looks! This looks absolutely wonderful. I often make a salad with peaches, mozzarella and torn toasted bread so it's a logical step to make this saltier, pizza-like version. Yum! I love pizza. Looks super yummy! Can’t wait to try! I love goat cheese and it seems as a great combo! Looks delish! Will be trying this one as soon as my 2 little ones give me a hr break! Can the dough be made before hand? Should it be stored in the freezer or fridge??? Fiona, I haven't prepared the dough beforehand, but don't see a reason why it shouldn't work. Let me know if you try it! I will have to try this. I cant imagine the goat cheese and the peaches together. This is an excellent twist to the classic Flammkuchen recipe. I think I'll like this better. I've never heard of Flammkuchen before until now. It sounds interesting though. I'm Sarah and I am a newbie and very excited about your recipes. I'm still new to cooking and I'm always looking for things to try. Once I get some more experience, I may just have to try this. I'd like to try the original as well, just to know the difference. The ingredients look simple, but I'm sure the flavor packs the punch! Do the feta cheese and peach flavors complement each other well? That's an interesting gourmet mix! Awesome pizza! Thanks for the recipe ! You have to try Flammkuchen with red onions, apples and goat cheese too....wonderful! That looks great. I hadn't heard of Flammkuchen before, either. Will have to try this. I'm still new to the kitchen and I'm always looking for things to try. Once I have a little more experience, I can just try it. I would try the original, well, just to see the difference. Wow, this flammkuchen sounds delicious!! Can't wait to try out the recipe this weekend. Thanks for the great post! This recipe sounds so nice and i have never heard of it before. I really like the sound of peaches and goats cheese together in something. Nice inspiration for the next diner! Thanks! This looks spectacular! I absolutely love the combination of sweet fruit and savory, creamy goat cheese. Can't wait to whip this up in my own kitchen! I have never heard of a Flammkuchen and had to google it to find out if it was something you made up :) Anyway, this looks so great and I love goat's cheese so will definitely try this. I'm going to try following the recipe too. The goat cheese part is quite cute. The idea of putting goat cheese on the pizza is quite unique. Nice change of pace. Thank you for sharing this recipe, which has inspired me to try something new!